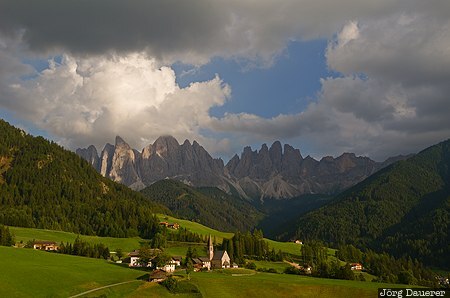 The small village St. Magdalena (Santa Maddalena) in the Villnöß valley surrounded by green meadows in front of the peaks of the Gruppo delle Odle (German: Geislergruppe) below dark clouds illuminated by warm evening light. St. Magdalena is in Trentino-Alto Adige (Südtirol) in northern Italy. This photo was taken in the evening of a sunny day in August of 2013. This photo is in the Photo Calendar "Alps". This photo was taken with a digital camera.